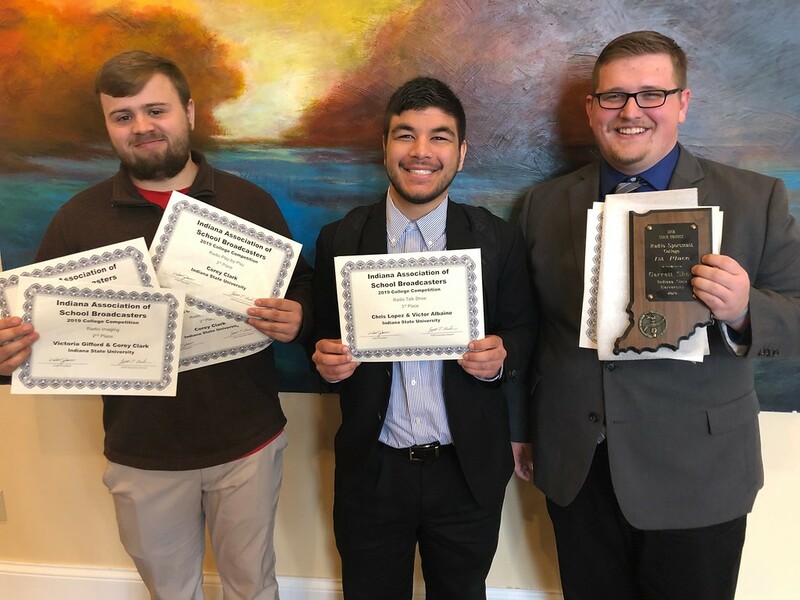 Indiana State students at WZIS won six awards from the Indiana Association of School Broadcasters (IASB) for work done in 2018. Garrett Short won first place for Radio Sportscast. AJ Goelz and Landon Kleindorfer won second place for Radio Sport Event Broadcast. Victoria Gifford won second place for Radio Imaging alongside Corey Clark, who also won third place for Radio Sportscast and third place for radio Play-by-Play. Chris Lopez and Victor Albaine won third place for Radio Talk Show. The awards were announced at the annual IASB conference in Carmel on March 30. "We've got a few students here who are very talented at what they do, but they also work really hard, they put in a lot of the effort," FM radio station manager Rich Green said. "They show up, they learn, and then they share that experience with others too so that helps trickle down and the others want to work with that and grow from that. That's my favorite part about this. The people who are doing well are also helping others to become better, and that's what I love." Student station manager and senior communication major Clark also credits the WZIS staff for their success. "It's a family atmosphere. They work hard, they care about each other, and they care about what they do," he said. IASB is an organization that supports high schools and colleges all across Indiana. It seeks to "promote professional excellence and student recognition in the area of media education," according to IASB's website. The awards WZIS won from IASB adds to the growing list the station has received for their work in 2018. The station was brought 11 awards home from the Intercollegiate Broadcasting System conference in February, including Best College Radio Station in the Nation. "It's hard to top what we've done this year;" Green said. "But I think that as we continue to grow and as we continue to establish ourselves as a destination for people who want to learn broadcasting, not just radio but video and multimedia, I think that will get us stronger in other areas. One of the things I want us to do is never just do the same thing. I want us to continue to grow." Photo: https://photos.smugmug.com/Other/Media-Services/Submitted-Photos/Staff-Uploads/i-dvGtMGH/0/f00c7598/XL/WZIS%20at%20IASB-XL.jpg -- From left, Indiana State University students Corey Clark, Victor Albaine and Landon Kleindorfer representing WZIS at the IASB awards in Carmel, Ind.